As you'd expect, the rear of the Samsung SF-565P holds the interface ports and the power connection. IEEE 1284 (parallel) and USB 1.1 ports provide connection to a computer, while a pair of standard RJ-11 phone jacks allow for phone line input and output. The power switch is also located at the rear (somewhat hard to find if you are groping from the front). 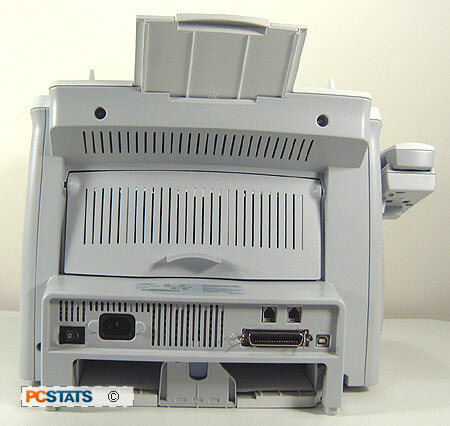 Above the various ports, a free-swinging hinged flap serves the dual purpose of ventilation and allowing access to the mechanism in case of a paper jam. The paper tray is open at the back of the printer, allowing the use of larger media like legal paper. 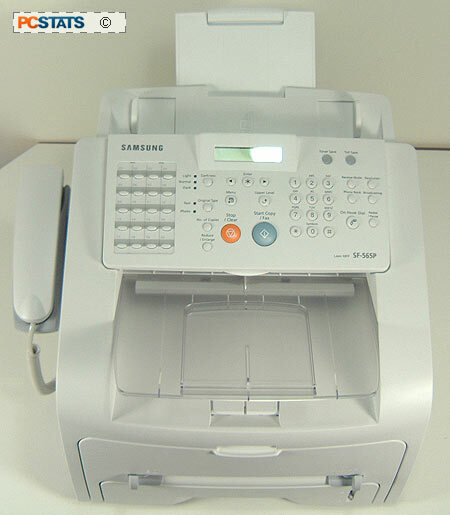 The top of the printer features the button-intensive control panel and LCD menu, as well as the ADF (Automatic Document Feeder) input for the scanner/fax/copy functions of the SF-565P. The feeder can holds 20 sheets at a time, feeding them directly through to the top paper output tray. 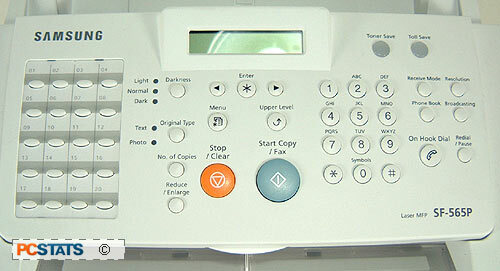 The control panel contains twenty instant dial fax buttons with space for labelling, an LCD-indicated button for controlling the darkness of printed documents (light, normal or dark), a text/photo auto-setting button, a button that controls the number of copies to be created, a reduce/enlarge button, menu controls, stop and start copy/fax buttons, the dialing pad, lit buttons for the toner save and toll save modes (more on these later), dial and redial buttons and a set of four fax shortcut buttons for resolution, broadcasting, phone book and receive mode. The LCD menu system is rather cumbersome to use, and requires a fair bit of drilling down before you can get the options you want. It does contain a lot of configuration options though, so for any advanced tasks it will need to be consulted. The two-line LCD desperately needs a backlight. We can't see any reason to neglect this obvious feature.